Here in the Netherlands, almost all supermarkets sell crispbread (knäckebröd) in paper. My favorite is the Wasa knäckebröd with sesame seeds. This is not so hard as the regular wholewheat variety and the sesame adds a delicious flavor. Some supermarkets also sell bread with only a paper label wrapped around it. For those more daring, you could bring your own reusable bag to buy some buns or you could even ask for bread that has not been packaged yet. Since most cheese and butter comes in paper, I use fruit, veggies and eggs for topping. 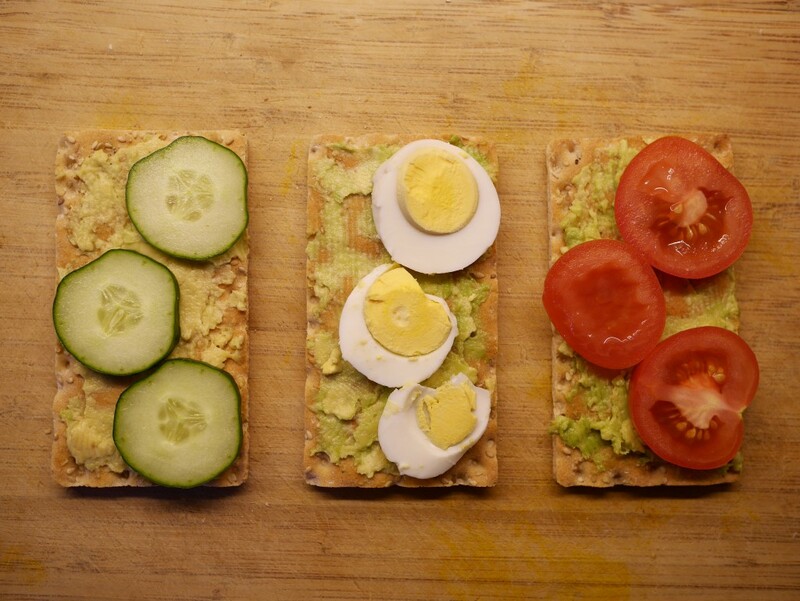 My favorite is a layer of avocado (make sure to choose ripe avocados) with some slices of tomato, boiled egg and cucumber. Not too heavy, yet nourishing, healthy, and colourful. Sprinkle some salt, pepper and olive oil to add flavor. Of course, you could also use other veggies, such as bell pepper or even banana or apple. Like the sandwiches, this only takes a few minutes to prepare. Eggs are usually easy to find in cartons. Take two or three eggs and bake them in some oil. I used olive oil that came in a glass bottle with metal lid, but of course you can take the plastic-free oil of your preference. 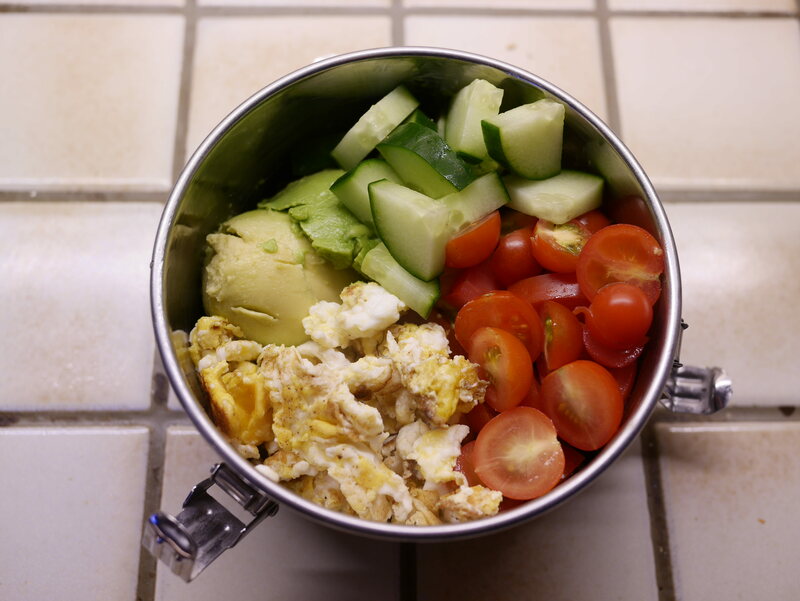 I bake the eggs just a few minutes, sprinkle some salt and pepper, and serve them with avocado, cucumber, and cherry tomatoes. If you like, you can add some fresh or dried herbs such as basil or cilantro. On cold, dark winter mornings, I love waking up with apple-pie oatmeal. For this, all you need is 100 gram oatmeal, 1 peeled and chopped or grated apple, some lemon juice (optional), 2 deciliter water, 1 teaspoon cinnamon, some fresh ginger, and salt. I buy oatmeal in paper packaging and cinnamon you can find in a small tin. In a small pot over medium heat, whisk together the ingredients. Heat over medium heat for a couple of minutes, stirring often. When the mixture thickens and the liquid is absorbed, it is ready. If it’s too thick, add some water. If it’s too watery, add some oat meal. When ready, pour into a dish, sprinkle cinnamon on top, and serve immediately. Share you’re favorite #PlasticFreeBreakfast and win! I’m sure there are many more simple options for a #PlasticFreeBreakfast out there. Otions may vary depending on where in the world you are. We would love to hear what your favorite #PlasticFreeBreakfast is. Please take of photo of it and share it with the rest of the world on social media. Amongst the contributions, we will pick one that will win Beth Terry’s new edition of “Plastic-Free: How I Kicked the Plastic Habit and How You Can Too”. For those of you who have not yet heard of her, check out the video below. Beth was the world’s first plastic-free pioneer. Her work is really inspiring and shows that plastic-free living can be done. Her book is a great resource for anyone looking for a smaller plastic footprint, both for starters and those that are already a familiar with a plastic-free lifestyle. This year, an updated version of the book came out and it’s even better than the previous edition. I highly recommend this book as well as her website and the TED video below. Beth offered us a copy to giveaway, so the winner will receive the book straight from her! If you want to win this book, share a picture of your plastic-free breakfast on Twitter or Instagram using #PlasticFreeBreakfast or post your photo as a comment under this blog post on our Facebook page. If you’re not on any of these social media platforms, you can send your photo by email to plasticfreebreakfast [@] plasticfreetuesday.com. Make sure to mention the country/city you’re based in. We will share the most creative contributions on our social media and/or website. We will pick a winner in two weeks from now (13 October). Make sure we have some way to get in touch with you. In 2013, after reading yet another article about plastic soup, Annemieke started her Dutch blog Plasticminimalism where she documented her small steps towards life with less plastic. To create more awareness about the adverse impacts of our plastic consumption, she launched Plastic-Free Tuesday in spring 2014. She strongly believes that building a better world starts by changing our own behavior. Annemieke is trained in environmental science and policy. She alternates living in the Netherlands, Sweden, the US, and China. My favorite plastic free breakfast is strawberries and almonds from the farmer’s market. I buy the strawberries at the market and return the basket to the farmer the next week, and I get the almonds in a reusable bag. I keep the almonds in a little mason jar in my purse and put the berries in a regular mason jar so they don’t get squished.